Queer art seems to finally be taking its place in global art institutions. Last year, we saw the Turner Prize steer itself from the conceptualism of Damien Hirst in the 90s to filmmaker Charlotte Prodger’s important interrogations on queer identity. In December, the artist was announced as the winner of the 2019 Turner Prize for Bridgit: a film which explored her coming out in rural Scotland and brought a deeply personal experience into the global art world focus. While this splash was critical for the progression of queer art, understanding that it exists in a sea of straight art history shows that we still have a long way to go to secure equality in the art world. And how do we ensure that LGBTQIA+ created and inclusive art is progressing authentically without fetishisation from heteronormative institutions? Aiming to drive this movement forward and answer this question is London-based queer artist support network Queerdirect who renegotiates the gallery space as a visible place for such artists. 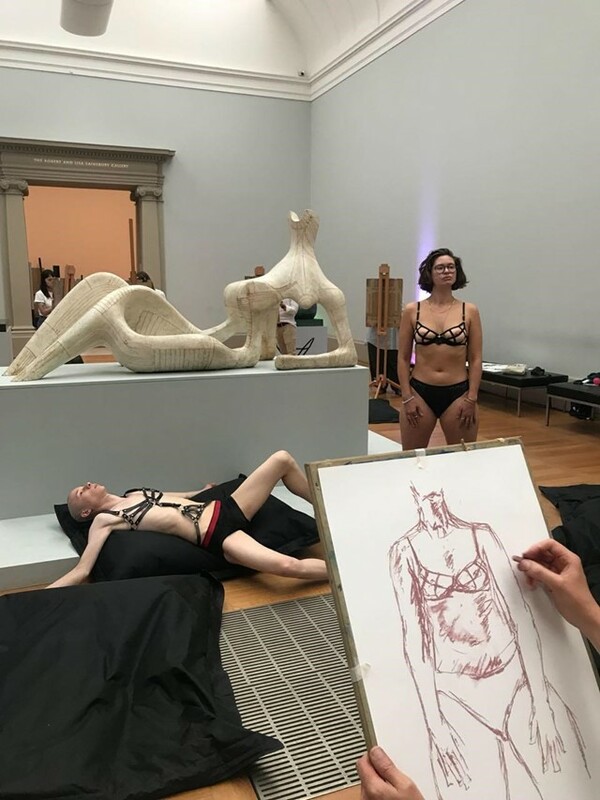 Founded by artists Gaby Sahhar and Lily Cheetah Nicolt in 2017, Queerdirect takes over large cultural institutions with events that create a queer presence, like its recent life drawing class which ran at the Tate Britain alongside the exhibition All Too Human, and replaced heteronormative bodies with LGBTQIA+ ones. Tonight, January 11, Queerdirect hosts its next event; a spoken word and poetry night at London’s ALMANAC projects in Bermondsey. Ahead of the event, we speak to Sahhar, co-founder of Queerdirect, about how we can authentically make queer artists more visible in the art world. Gaby Sahhar: I started Queerdirect it in 2017, and co-run it with Lily Cheetah Nicolt. I was working with really talented LGBTQIA+ identifying artist through galleries, institutions, and spaces which I thought were not getting enough recognition or exposure. I also noticed that at the time a lot of LGBTQIA+ events would often exclusively happen during Pride month, but I wanted to create something consistently dedicated to the LGBTQIA+ cause all year long. There was also no dedicated contemporary art space or gallery for LGBTQIA+ arts in the UK. Gaby Sahhar: Culture adapts to our time, it is something that is continuously changing in society. As the spectrum of sexuality and gender are spoken about more in society, today it should be reflected within our cultural institutions. It’s important for these conversations to happen in cultural institutions correctly, and if we can use art to educate, archive, and aid these experiences by looking through alternative lenses, including the queer lens, then we should. Gaby Sahhar: Galleries and museums in the last two years have really picked up on queer artists and curated them into their programme rigorously which is great, but I think institutions need to be careful about how they give visibility to a queer-identifying artist, not just working with someone based on “hype” around them but on the content of their work. Someone who also speaks well for the community they're representing is always important. I think institutions should also have a dedicated queer space for queer arts. Gaby Sahhar: We also feel that institutions should mirror the aspects of queer cultural and political history where LGBTQIA+ people have collaborated and supported one another as a marginalised community. We would like to see institutions employ more LGBTQIA+ people as permanent staff, curators, programmers, and in more senior positions at the top of cultural institutions. Gaby Sahhar: We’ve had so many great events this year it’s hard to single out one. But our favourite project was our one-month-long queer life drawing course at Tate Britain in response to the All Too Human exhibition. Everyone on the course identified as LGBTQIA+ and the ages ranged from 16 – 60. Together we would engage in group discussions, challenging ideas around representations of queer bodies in institutions, and we would purposely misinterpret artworks in Tate’s collection to be read as queer. We did this through recreating artworks through life modelling, props, and bridging the gap between current topics of conversation in the LGBTQIA+ community. For our next event, we have partnered up with ALMANAC projects in Bermondsey, who approached us to curate a spoken word performance night in the current exhibition by Adam Christensen, who is a transvestite performance musician. The night will focus on Chloe Filani, Danielle Brathwaite-Shirley, rkss (Robin Buckley), with no overarching theme other than focusing on the three individual’s art practises as performers, poets, and DJs. Gaby Sahhar: We are really inspired by our peers. Our network, our friends, anyone who is trying to push forward the LGBTQIA+ narrative in a subversive way. We are also inspired by thinkers and writers such as Judith Butler, Audre Lorde, Susan Sontag, Octavia E Butler, and Hannah Black. Another big inspiration for us in nightlife. We go out a lot and that's often how we meet the artists we work with. We are really inspired by the architecture of the city and how LGBTQIA+ people often form their own culture and spaces within that architecture.